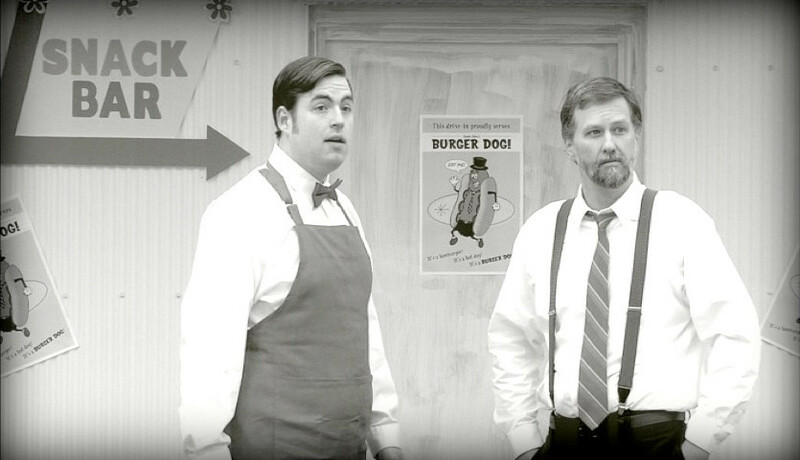 Shot in black and white and run through a mild scratch filter, the film seeks to recall the look of horror films from the late 1950s to early 1960s. It never quite convinces, but I found it easy enough to play along although the cigarette burns are a distraction. The important thing is to be in the mindset of an old monster movie, and the sets and wardrobe certainly help achieve that. Zita Marcjak (Shannon McDonough) and Howard Johnson (Daniel Sjerven) get engaged in a malt shop. The plot is wonderfully retro. 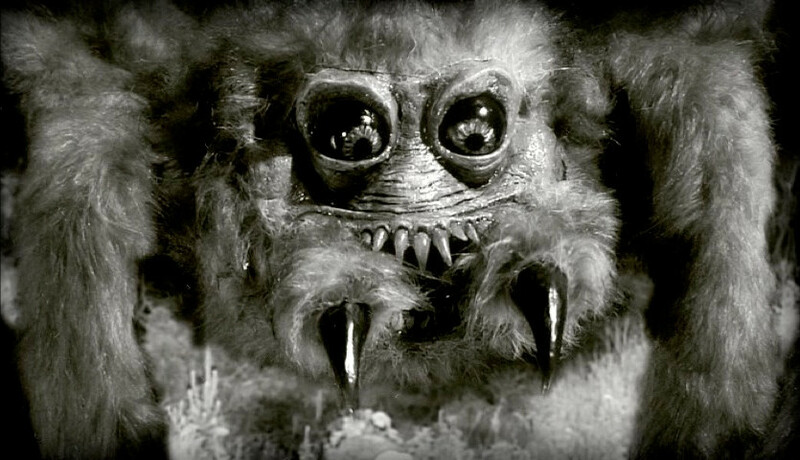 Underground nuclear testing results in a giant spider crawling out of the caves near Phantom Lake. The military is powerless to stop it, so it’s up to scientists and a reporter to put an end to the beast. There are lots of scenes of a tarantula moseying toward town, which is a good way to keep me happy. Moreover, there’s a fairly good understanding of the odd dynamics of teams in old monster films. 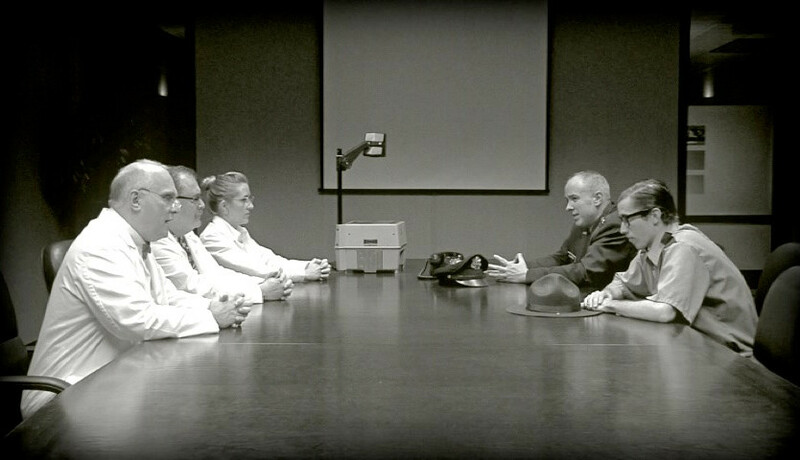 An army general, a reporter, and a couple of scientists hammer out strategies in a meeting room, which is the sort of mix you see in a lot of these movies. It’s absurd, but it’s appropriately absurd, and to me that’s the best way to evaluate an homage. 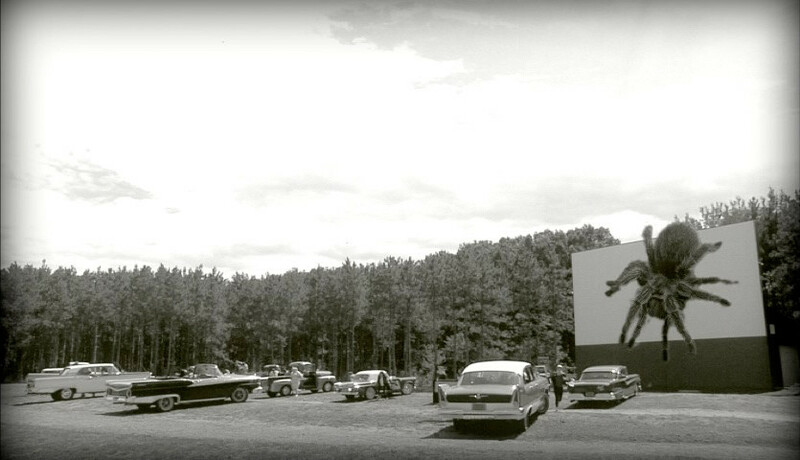 Writer/director Christopher Mihm has a cameo as the owner of the local drive-in. On that note, my biggest complaint is with the character of General Castle (Mark Haider), who is less of a typical representation of the military man of yore than a figure of disdain. In the world of (non-comedic) mid-century creature features, the military is populated by reasonable men of action. The officers would mutter about science and non-violent solutions, but at the end of the day they respected the eggheads as fellow professionals. Here, General Castle is actively opposed to any scientific approach until after his troops have failed. Even his belligerent misogyny is out of sync with the sexism of the films of the time. Yes, women made sandwiches and coffee; there were often surprised exclamations or doubt expressed at their presence in elite circles; it’s not unusual for a few incredulous mutterings or a question about wanting kids; but Castle’s refusal to allow Dr. Hackett (Billie Jo Konze) to even speak makes him a bully instead of a leader. Castle’s presentation as an aggressive obstacle goes against the main themes of the era the movie harkens back to, and it’s the sour note in an otherwise enjoyable romp. The situation room, a small conference room at the university. For me, of course, the bulk of the enjoyment comes from the giant spider. It shows up in the opening scene, crossing a wooded path near where a young boy is playing, and we get a number of looks at it as it walks directly to town. We’re never given a reason why it emerges from the caves or walks in a straight line, and I don’t really need one. The important thing is that it’s eating everyone in its path. The beast is portrayed by a live tarantula, which is a lovely callback in this age of CGI monsters. Even more exciting for me is the crap puppet used for closeup shots. It looks nothing like the actual spider, which reminds me of films like The Black Scorpion where the effects teams don’t appear to have been aware of each other. There’s also a giant leg prop that pokes at our heroes, which is a delightful touch. The result is that the heart of the film, it’s monster, feels authentic for the targeted style of movie crafting. The wonderfully wonky spider puppet. 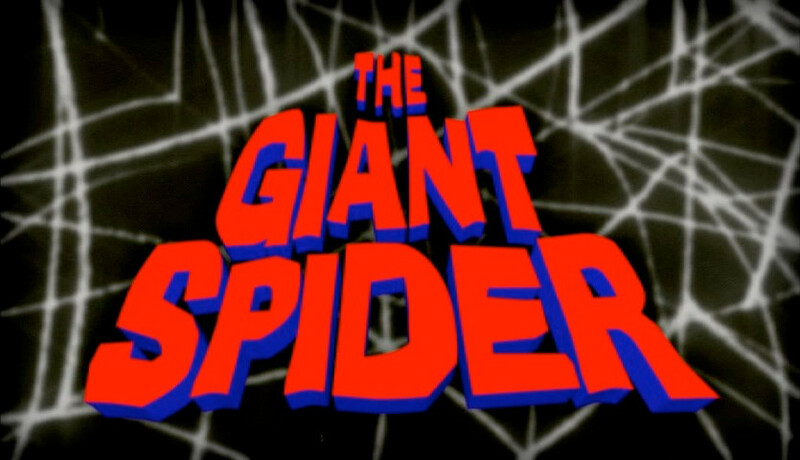 As a fan of mid-century monster flicks, I like The Giant Spider a lot. While it’s modern origins are obvious, Mihm’s affection for his sources is plain. In some of the scenes you can see traces of spider classics Tarantula and Earth vs the Spider . If you’re looking for a fun homage this should certainly whet your whistle, but if you’re after a precise recreation it’s probably going to frustrate you. It tries and does a pretty fair job of it, and that’s enough to get me in its dark and web-filled corner. This is my favorite shot in the movie, for reasons. And You Call Yourself a Scientist! ?